A mix of clouds and sun during the morning will give way to cloudy skies this afternoon. A stray shower or thunderstorm is possible. High near 80F. Winds SSE at 5 to 10 mph..
Cloudy with occasional light rain late. Thunder possible. Low 59F. Winds SSW at 5 to 10 mph. Chance of rain 70%. 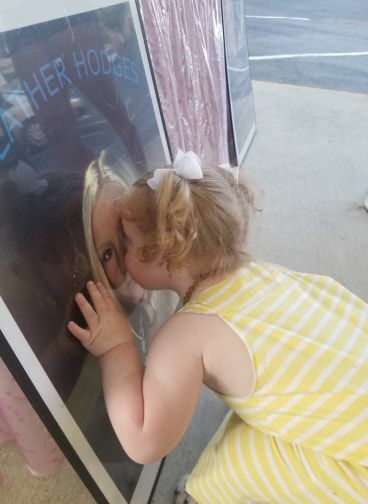 Ivy Grace Songer, 2, kisses a missing poster of her aunt Heather Hodges during the candelight vigil held Wednesday night. Hodges’ daughter was the same age when Hodges disappeared. Heather Hodges’ mother, Paula Hodges and Allan Journigan remember Heather during a candelight vigil on the seventh anniversary of Heather’s disappearance. That is how Paula Hodges remembers her daughter who disappeared seven years ago. Hodges, then 22, was last seen at her Rocky Mount residence on April 9, 2012. She was reported missing on April 11. The missing persons case was elevated to a criminal investigation in June 2012, when evidence was found that a “violent event” preceded her disappearance, according to the Franklin County Sheriff’s Office. In a statement released Wednesday, sheriff’s office spokesperson Capt. Phillip Young confirmed that investigators have a suspect and continue “to work diligently” to solve the case. No one has seen Hodges since she was with her then-boyfriend Paul “Scooter” Jordan at the house they shared on Shady Lane in Rocky Mount. Jordan told investigators that he left the house for about 10 minutes and was unable to locate Hodges when he returned. Jordan was sentenced to seven and a half years in December after entering an Alford plea to an unrelated abduction charge. An Alford plea means he pled guilty while still maintaining he is innocent. The sentence was a result of a July 2017 arrest for felony abduction by force/intimidation, according to court records. The case was unrelated to Hodges’ disappearance. Meanwhile, Hodges’ friends and family are still hoping someone will come forward with information. “I just want it all over with,” Paula said. Cheryl Pagans said at the first vigil on the one-year anniversary, she felt more hope than she does now. She added she continues to work with The Aware Foundation and the family as a family friend and advocate because of Hodges’ daughter, who was just 2 years old when Hodges disappeared. Kenny Jarels, founder of The Aware Foundation, said through a private donation, four billboards in Roanoke featured Hodges’ photos and the words “Never Lose Hope” for the seventh anniversary. Anyone with information is asked to call the sheriff’s office at 483-3000 or the crime line at 344-8500.